Discussion in 'Guitars in General' started by Bloozman, May 6, 2008. I recently purchased a Johnny A without even playing one. 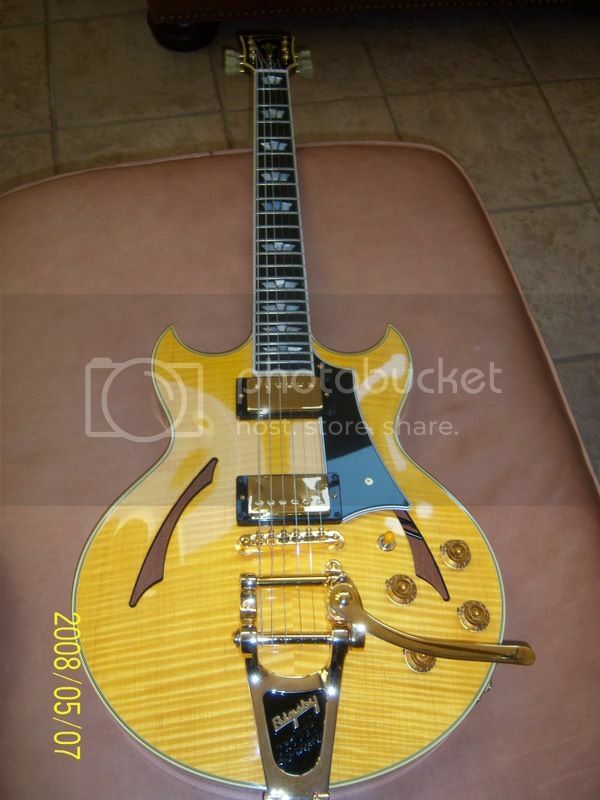 I was so enamoured by the looks and specs of this guitar, I bought it off the net sight unseen. I must say that for my style of playing, I'm a little disapointed in the guitar. I have the following amps.. I have tried the Johnny A thru all of the listed amps, and I get the best sound from the Super-Sonic, and even at that it isn't even close to the sound I get from my Firebird. Im a blues player, and the JA seems just too bright for my tastes. Maybe the JA isn't for me.. Anyone have similiar results on this beautiful axe?? Suggestions maybe? BTW..Its flame maple top with black translucent finish and bigsby. Keep at it, fiddle. mess around. You'll find something that works eventually. Don't give up too soon. After a while, if you still don't do well with it... then you can flip it. Johhny A has some tapes on You Tube where he talks about his three distinct and very "different" Johnny A models. He says each one has a very different sound that he used for different songs, etc. So maybe it was one of the other two guitars you were after. Your JA is BRIGHT??? Compared to a FIREBIRD???? Wow - that would be the LAST word that I would use to describe the sound of my JA (which is completely stock). But then again, I'm not playing blues - I'm playing fusion, jazz, and stuff similar to what Johnny A. himself plays. The Firebird V and VII that I recently tried out were amazingly bright and punchy...much more so than my JA..
By the way - did you get your JA off eBay from some guy in Jersey? Yeah..I just bought it like 3 weeks ago...The axe is beautiful!!! Well...I am hoping its great. I just bought one off a guy in Boulder on Ebay. Mucho $, but hope it lives up! Purty is one thing, but tone is another. Mods - please step in. No JA threads without pics. The Johnny A's are fairly bright guitars. A couple observations, -- I think the Bigsby models are a bit brighter and thinner sounding than the stop tails, so that might be a factor. Also I don't care for the stock pickups too much, you might consider swapping them out for some mellower-sounding PAF clones. I have a stop-tail version and it's very articulate but not annoyingly bright, although occasionally I will roll off the tone a little on the bridge pickup. Personally I think it would improve the Johnny A Signature if they had used rosewood fingerboards rather than ebony, it would mellow out the attack a bit. The thing that makes the Johnny A. special to me IS the articulation that comes from the ebony board, long scale length and maple top. When you add to that the guitar's naturally compressed dynamics, you get a very unique tone. I personally don't equate articulation to "brightness"... to my ears, the JA has all the warmth of a 335 without the 335's muted top end ... I find it to be the perfect middle ground between a rock guitar and a jazz box. That said, I don't think that the JA really works well when routed into overdrives or an overdriven amp. The compression and snappy top that work well into a clean amp make the overdriven sound flat dull in the mids and brittle on top. Again - these are just MY observations from playing my JA in different setting over the past couple of years. For reference, I use either an UG30 or a Dr. Z Maz into G12H30's for rock and blues gigs, and use a Tim, Howler and Zendrive for my OD pedals. When I do a rock or a blues gig, I much prefer the tones of either my 339 or my Hamer Artist Custom. I can't imagine JA being used as a blues or rock guitar...not the typical tone at all. Mine would be an awful blues/ rock axe. Try a Collings I35 if you gotta have a really expensive semi-hollow rock blues guitar. Night and Day difference. The JA kills in alt-rock sounds though. lush texturals where every note is distinct, great trem, open and jangly ir you want. Just not thick OD stuff. Interesting observations! Shows how vastly opinions differ on this instrument. I love mine because it's so versatile. I'm just a hobbyist, home jam guy and play mostly blues and classic rock but dabble in a little jazz and country...to my ear, the JA excels in all those genres. If I'm switching to a different style of music, simple use of tone controls or minor amp adjustments and it's ready to roll. I should say that I did swap pickups to Wolfetone Dr. V's due to issues with the stock p'ups. Bloozman, I think everyone has chimed in with perfect observations. I would ask if you have played it in a band setting yet? To me, the additional snap on the top end helps it cut through the mix very nicely. Like some others I enjoy it more with a clean/edge of break up tone and less with a lot of gain. Changing pickups also makes a big difference. For blues I think it sounds great, but then I also like Telecasters. If you want a darker tone I just roll back the tone knob a touch. The bridge/neck pickup combo softens the high end up but cuts thru nicely. Try playing around with that combo and adjusting the volume and tone knobs.if you always play wide open you may be missing out on some of the versatility. I saw JA a couple weeks ago and he was on the neck and middle a lot more than I would have thought. Either way, it might be the most gorgeous guitar made! If you want the JA with the tone profile shifted towards the warmer side, try the JA Standard. Mahogany top instead of maple and RW board. Plus they are about a $1000 cheaper and still look killer. I love my Johnny A, I find it's tone is balanced very nicely for what I like to hear and the tone controls work great when I want that very jazzy tone. One of the best guitars I've ever played. Bingo. My Std. (with Bigsby and stock pup's) is a rock monster! Think 70s Alex Lifeson and you'll get an idea for the tones (minus talent) I get when cranked through a vintage Hiwatt, Marshall, or Orange. I would never call my JA w/stoptail "bright", that's a very different adjective then what I'd expect. I also usually keep my high tone control on whatever amp I'm using somewhere between 10-1 o'clock. My preference for guitar sounds could be considered more "throaty", a cello as compared to a violin (single-coils), but I do think the 25.5 gives it a nice high-end snap. I feel mine is very well balanced low-high, the first time I played it, I was so struck with how big it sounded, how full it's frequency range comes across, the lows are tight and strong and the highs are never shrill. I think they sound great overdriven, they can't do metal IMO, but eveything else is very possible. I get lots of compliments on it's sounds. I never thought I'd be so fortunate, this is all I need...semi-hollow heaven! Have you tried turning the tone down? I do that on all ebony board guitars. Also I usually roll the volume back a bit to about 9 or 9.5 as well. Have you really tried dialing in your amp for the guitar...I mean full experimentation with all controls? IMHO the JA is awesome for blues or any other style of music...but if it's not your thing it's not your thing. If you prefer a solidbody then you are far from home with the JA. I love the transblack Johnny A. Love it.